For my undergraduate thesis, I conducted original HCI research exploring tangible and multitouch interfaces in gaming. 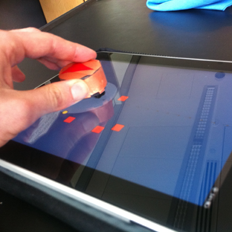 I built a twin-stick shooter for the iPad with three different control schemes, including a tangible interface where the player physically moves a custom-built plastic game piece on top of the iPad's screen. The study explored the relative performance of each interface among test participants, focusing specifically on ease of learning, overall performance, and the use of optional multitouch gestures. The full whitepaper is available on the Bard College Digital Commons.